Intellectual Property. The information on this Web site, including without limitation all design, text, images, white papers, press releases, and other information, is protected under United States and other copyright laws and is owned by Fluor Corporation or used under license from the copyright owner. 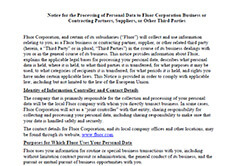 The information may not, except under written license, be copied, reproduced, transmitted, displayed, performed, distributed, rented, sublicensed, altered, stored for subsequent use or otherwise used in whole or in part in any manner without Fluor's prior written consent, except to the extent that such use is authorized under the United States copyright laws. Fluor's trademarks, logos, images, and service marks used on this site are the property of Fluor and may not be used without permission from Fluor and then only with proper acknowledgment. No Representations and Warranties. While Fluor attempts to make sure that only accurate and up-to-date information is presented on this Web site, Fluor assumes no responsibility for, and makes no representations with respect to, the accuracy of any information presented here. Therefore, all materials and information are presented "AS IS," and FLUOR EXPRESSLY DISCLAIMS ANY IMPLIED OR EXPRESS WARRANTIES OF MERCHANTABILITY, FITNESS FOR A PARTICULAR PURPOSE, OR NON-INFRINGEMENT OF INTELLECTUAL PROPERTY RELATING TO SUCH MATERIAL. IN NO EVENT SHALL FLUOR BE LIABLE FOR ANY DAMAGES WHATSOEVER, INCLUDING WITHOUT LIMITATION SPECIAL, INDIRECT, CONSEQUENTIAL, OR INCIDENTAL DAMAGES, INCLUDING WITHOUT LIMITATION, DAMAGES RESULTING FROM THE USE OF, OR RELIANCE ON, THE INFORMATION PRESENTED, OR LOSS OF PROFITS OR REVENUES. Fluor may revise these Terms and Conditions at any time. Revisions will be posted on this "Terms and Conditions" page and users are responsible for reviewing the page from time to time to ensure compliance.